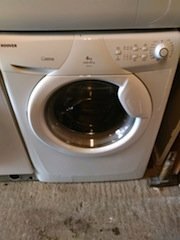 A white under counter Hoover 6kg 1600 spin washing machine. 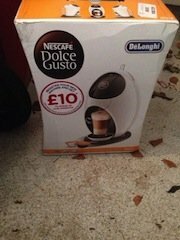 A brand new boxed white and black egg shaped Nescafe Dolce Gusto coffee machine by DeLonghi. 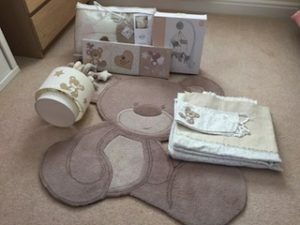 A collection of neutral coloured teddy bear themed nursery accessories, to include a large rug, a rectangular canvas, a lampshade etc. 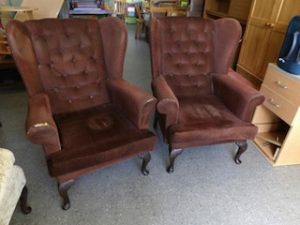 A pair of vintage wingback fireside armchairs on mahogany legs, upholstered in chocolate brown velour. 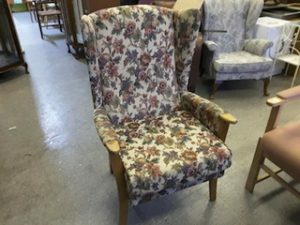 A vintage wingback fireside armchair on a solid pine base, upholstered in floral patterned fabric. 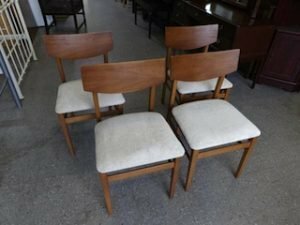 A set of four retro solid wood low back dining chairs, upholstered to the base in cream corded fabric. 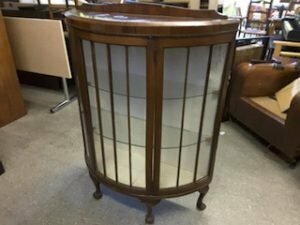 A large vintage solid wood and glass inlaid display cabinet on lion paw feet, having two glass shelves inside. 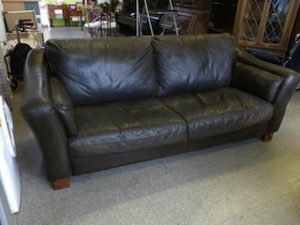 A two seater high back sofa on solid wood legs, upholstered in black authentic leather. 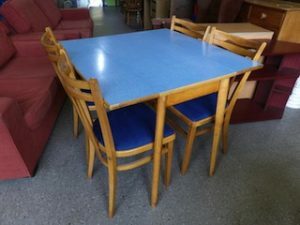 A blue topped solid wood drop leaf square dining table, together with four curved back dining chairs, upholstered to the seats in blue fabric. 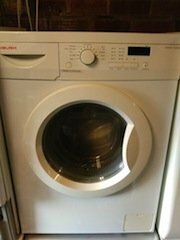 A white under counter Bush 9kg 1400 spin washing machine. 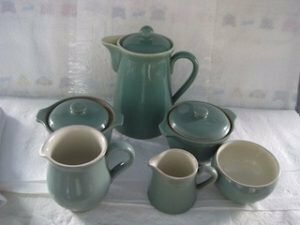 A collection of vintage sage green Denby kitchen accessories, to include a large teapot, two lidded soup bowls, two milk jugs and a sugar bowl. 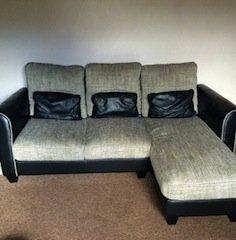 A four seater high back right hand corner sofa, upholstered in black faux leather and grey fabric. 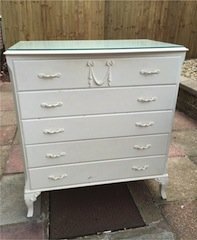 A heavily carved hand painted white glass topped chest of drawers in the shabby chic style. A tall standing vintage mahogany glass inlaid dresser unit, having a double cupboard above two small and two large drawers. 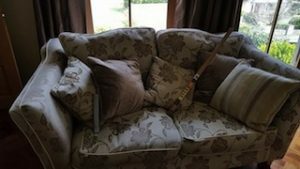 A two seater high back sofa on solid wood legs, upholstered in brown and cream floral patterned fabric. 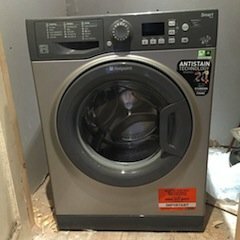 A silver and graphite Hotpoint under counter 7kg 1200 spin washing machine. 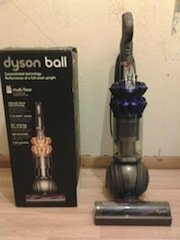 A grey and navy blue upright Dyson ball Multi floor vacuum cleaner. 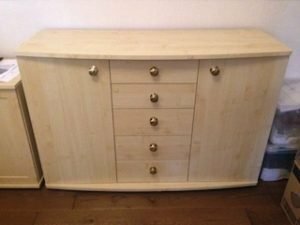 A large solid pine contemporary sideboard, having a large cupboard to either side of five drawers. A solid mahogany circular dining table, together with three low back dining chairs, upholstered to the seats in striped cream fabric. 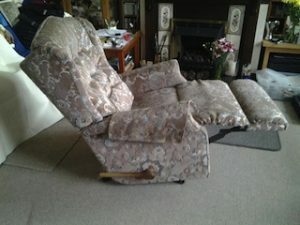 A vintage high back reclining gentleman’s armchair, upholstered in floral patterned velour.